Online success can be defined as a website that achieves both your investment goals & communication objectives. We begin by understanding what products and/or services are critical to the financial wellbeing of your organization. Next we consider any areas for future growth, such as new products and services, or specific geographic areas targeted for expansion. Once this review is completed, your investment goals can be clarified into a set of priorities. These priorities are then compared to your website to determine how they match up with your conversion tools. We create a strategy that addresses these two critical aspects and utilizes it as a guide to customize an Internet Marketing program geared for maximum performance. Acknowledging that website visitors may not have a good understanding of who you are, means the first thing you must do is to tell them. However, you must tell visitors who you are in terms of the major benefits provided by your products and services instead of with factual details about your organization. Maximizing your online ROI is dependent upon converting interest from website visitors into ACTION. It is a dynamic process, where ongoing evaluation aims to continually improve results. At My SEO Source we follow these steps to improve client conversion on an ongoing basis using a set of priorities that are directly related to their financial wellbeing. Identify different types and levels of conversion. Make sure they are properly integrated into your website. Measure their effectiveness by tracking activity. Constantly evaluate conversion to improve performance. Identifying your target markets is vital when deciding how to communicate with them. Are you dealing with a B2B transaction or the B2C market? These types of questions need to be clarified when setting your communication objectives. 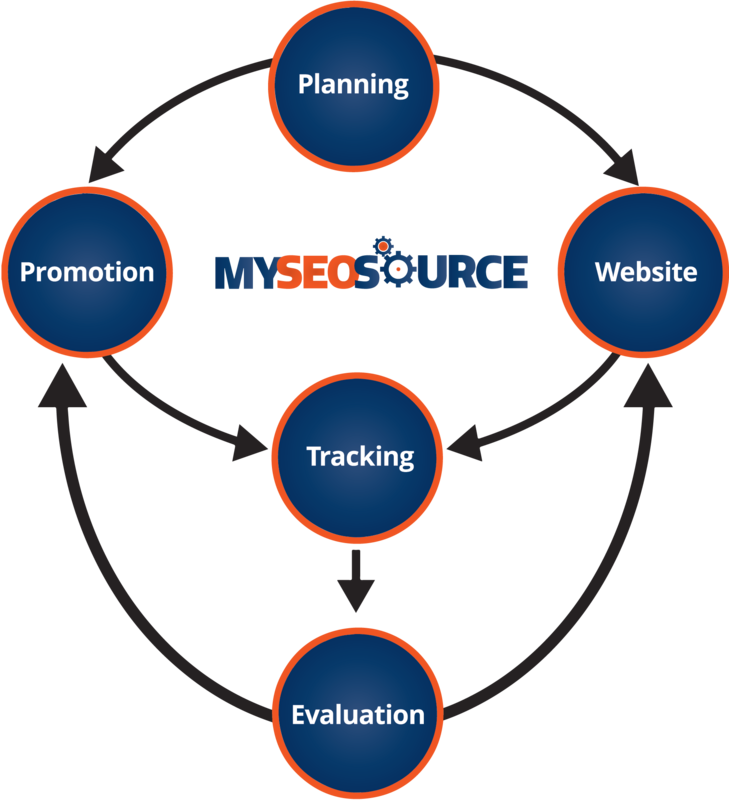 At My SEO Source we understand that your website strategy must address both your investment goals and communication objectives. We can help you create an online strategy that can be applied to a Website or Internet Marketing program aimed at improving your results. Identify the products and/or services that are critical to the financial wellbeing of your organization and any key areas targeted for growth. This information provides a starting point for keyword research. Pay special attention to your communication objectives. Review all the text, graphics, images, and illustrations available to you for use at your website. Check out what your competitors are doing online. By competitors we mean those who you know, and those who are already ranking for your desired keywords at search engines right now. They can be the same or different. Create a site map that will act as a guide for website development or redesign. Consider any programming elements (i.e. photo or product gallery, ecommerce, etc.) that can empower website visitors. Review Internet Branding, the different ways to convert your website visitors. Understanding your brand in terms of products and services, and identifying the primary target markets you need to address will go a long way towards determining the core messages you need to deliver. Asking questions is helpful when evaluating your online programs. Does your current website reflect who you are? Does your website achieve its investment goals? What is your ROI? What are your communication objectives and does your website achieve them? Was your website constructed with search engine friendly methods? How much new content do you plan to add? How often? Do you have a customized online marketing strategy? How was it developed? How successful have you been at driving the right kind of traffic to your website? How did you determine the most effective keywords & phases for your online marketing programs? What type of follow up or continuation communication do you provide? What tools do you employ to track activity? Do you track phone calls? Do your tracking tools provide a better understanding of how to make adjustments to your website and Internet Marketing programs that improve ROI? How do you evaluate performance? How often? How do you make data driven decisions? Collectively, we have a lot of answers.